The CWI-F30 “T” Style fencing system is extremely accurate and rugged and will enhance on old table saw to be a pleasure to use again. The table saw fence is the heart of a table saw and without one that is easy to use and accurate woodworking can be quite a chore. If you have an old saw with a worn out fence or even a new saw that was supplied with an inferior fence the Stallion F30 table saw fencing system will solve your concerns. The Stallion CWI-F30 heavy duty universal table saw fence system was developed by CWI Woodworking Technologies for smoothness of operation and accuracy in the cut. 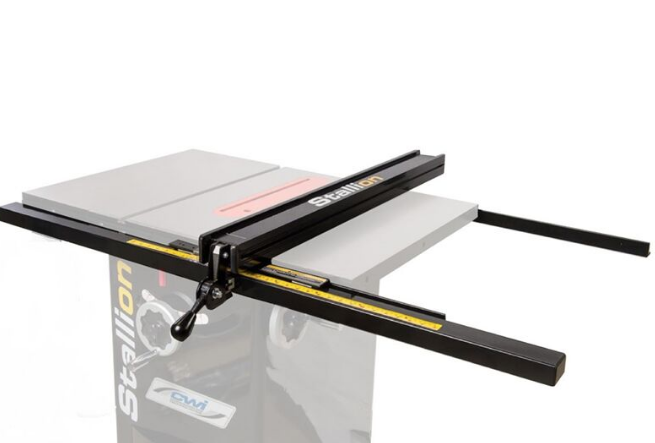 The F30 can be used on most table saws with cast iron tables that are 27” front to back. Modifications can be made to fit other widths of tables as well. The F30 fence allows for cutting material sizes up to 30” to the right of the saw blade and 12” to the left of the saw blade. The F30 features a 41” long x 4” wide and 2.5” tall black welded steel body with black anodized aluminum fence sides with t-slots for mounting sacrifice boards if wanted. The “T” style heavy duty fence slides on durable plastic ways along the 57” x 2 3/8” x 1.5” front fence tube which is bolted to the 2” angle iron rail. The rail gets bolted to the front edge of the users cast iron table saw top. Holes will need to be drilled through the edge of the cast iron table top to line up the fence properly. A standard metal cutting drill bit can easily drill the cast iron. The fence also rides on a 1.5” angle iron back rail which needs to mount to the back edge of the cast iron top. There is a shoe mounted to the bottom of the fence which rides on the back rail while in use. There is a magnified reading lens which can be mounted on either sides of the fence to allow easy reading of the supplied self-adhesive measurement scale which reads in both metric and imperial measurements. Browse the product archive. Type: Sawing Equipment. Brand: Stallion. Accessory: Accessory Product. Bookmark the permalink.